DFWCityhomes is an established Flat Fee MLS listing Service and Full Service real estate company that represents buyers and sellers in Bedford, Texas. Our clients receive a full service experience with agent representation at a fraction of the cost. Our simplified process is hassle free, proven, and effective. Interested in learning more? Watch this video and click MLS Listing Services or Buyer Rebate Services to see how we may help you. Contact Us or Call (214)-207-0210 and we will explain to you how our services can save you time and money. 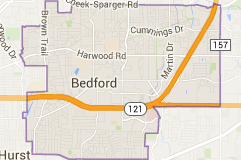 Bedford, Texas is ideally located in the Dallas/ Fort Worth Area. Bedford is a safe, friendly community with a small town feel. Bedford is Just minutes away from everything the Metroplex has to offer. Bedford is part The HEB Independent School District along with Hurst and Euless. HEB ISD has a long tradition of being recognized and rewarded for its achievements. Bedford is a suburban city located in northeast Tarrant County, Texas, in the “Mid-Cities” area between Dallas and Fort Worth. It is a suburb of Fort Worth. The population was 46,979 at the 2010 census.